In late January I went to a one day workshop with Dominic Barter, someone I’ve been wanting to hear for many years. He’s been doing amazing work originating in Rio de Janeiro where he lives, rebuilding communities by creating a bottom-up system of justice in a place where the death rate among young black men from gun shootings is one of the highest in the world. The practices he and others evolved is now called “Restorative Circles”, and is used in over 30 countries around the world. During the day he told the story of his 20 year journey, from the first conversation with kids on the streets to a decision by the Brazilian justice department that RC should be available in every youth court. What follows is a write up of the workshop. It is NOT a guide a running Restorative Circles – I’m hoping Dominic will come back and run a longer training (see below for contact information). I think this is a brilliant and necessary complementary piece to Transition, and the teachings resonate deeply with the “Healthy Human Culture” insights I’ve come to. It also resonates a lot for me with my experience of a lot of the culture I’ve found in the wider world, and in Transition, particularly Transition Network (who are, interestingly, starting to engage with a process of reflection as I write this). Many people have asked for these notes, so I thought it would be easier just to post them here! Our systems for handling conflict need to be sustainable – ensuring people are supported on both an inner and outer level. “Set up communities of support” was his main message from the workshop (before “go out and resolve conflicts”)!! There are two cultural orientations to conflict. One completely permeates our western modern culture, which is to move away from it – using a professional “criminal justice system” to deal with it, lock up or punish the “offenders”. The other is to move towards it. When you move away from conflict it escalates and gets more dangerous, because the pain it’s expressing still isn’t being heard. When you move towards it conflict usually gets safer. Conflict is about a system updating itself – new information arrives and the system needs to change to grow (in depth or complexity, not size). We do this continually – most “conflict” doesn’t even encounter a disagreement. This updating causes conflict when there is resistance to the change that’s needed – when people are invested in the status quo and won’t let go. Conflict is a symptom of pain in the system – and usually of pain that has already gone unnoticed for some time. So it’s the escalation of pain trying to be heard. Who feels the pain, and who engages in conflict is a lot to do with rank. People who have a lot of rank in the system have already shaped it to suit them, and don’t have issues with the way it works. People with less rank will find the system doesn’t work for them in some ways,(SB – and will experience pain – and further pain if they aren’t responded to). People with rank in a system can afford to ignore conflict. Restorative Circles (the name for Dominic’s form of Restorative justice – of which there are many varieties) evolved as a response to the question “how does a community come together when there is pain?” – seeing that the community he was learning about (a violent gang-run favella inRio de Janeiro) knew how to celebrate together, but not to handle its pain and violence. The facilitator will help to bring out the feeling and meaning layer, which is where the conflict is actually resolved. This wasn’t a training workshop, and I missed a lot of the steps. This is NOT a guide to how to hold a Restorative Circle. Dominic started his first conversation with kids in the nearest favella to where he lives inRio20 years ago. 11 years ago they held the first RC as part of a court case in the criminal justice system. A few months ago the supreme court (?) ofBrazildecided that all youth courts in the country should have RC available as part of the system. 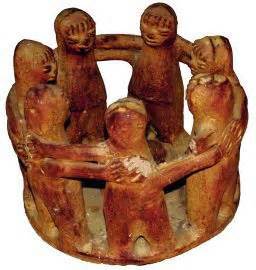 Restorative Circles have spread to over 30 countries and are used in many kinds of community, organisation and relationship, as well as in formal justice systems. I think it’s helpful to know that RC wasn’t developed in comfortable white middle class workshops, but as a direct response to working with the poorest and most impacted in a city where 65,000 people a year die, mostly young black men, from being shot in gang related killings. He described Rio as a war zone, where the weapons aren’t pistols but automatic machine guns, and the death rate is higher thanBeirut, or many other better known places of violence. These are my insights – seeing that what Dominic describes exactly parallels the work I’ve been doing on human systems in health / unhealth, and the culture that creates either one. A healthy system wants to understand and respond to the signal, seeking to learn from it. This starts with having both time to reflect on signals, and a commitment to learn from them, leading to change. Those with least power usually feel the pain of the system while those with most power can choose to ignore, dismiss, or export it. Dominic didn’t look at the stress / nervous system layer which I think is crucial. That in an unhealthy system the culture is shaped by a chronically switched on stressed sympathetic nervous system which is run by a ground state of fear, and defaults to fight / flight. A little thought makes it clear why burnout and conflict are the natural symptoms of a system run by the sympathetic nervous system. The end result of continued flight (fear driven activity) is exhaustion or collapse and the consequence of the fight aspect is conflict. (Of course it’s much more complex than this) You could say that these symptoms in your system are indicators that you have a culture shaped by this kind of state of consciousness. This isn’t “the truth” – it’s a write up from notes I took. If something is confusing, or doesn’t make sense it’s probably because I didn’t write things down precisely. Please use it only to get a general sense of Dominic’s valuable work! I’ve written some of it as if Dominic is speaking – but it’s still only my memory of what he said. Opening – Dominic gives us his frame! Everything is voluntary, the doors are open – this is not a school, but many of us have had the experience of education where we “had to”. If you decide to stay what you bring is important. Together we are making a community that needs to be sustainable. There are two ways of handling conflict. One you don’t need to learn – it’s everywhere. You can go into a phone box and find a number to ring that operates in the dominant system. It’s in most of our films and stories, our politics, how we run business, schools and the current system of criminal justice. The essence of the system is that when we get into conflict we create distance. We move away from those we are in conflict with. The other way of dealing with conflict is that when it arises we come together more. And to be able to do this we need to set up some PRE-CONDITIONS. This is about thinking politically, waking up people who don’t want to listen or change. This is where communities start to engage with their power. I’m not here on my own. You are scary! I can’t stand up here alone. Before I came I set up a support system. This is for you, not just for me. If I’m not ok I’m going to make it not ok for you. So my first responsibility is to make sure that I have the support I need to stand up here and be present, and be ok. I made a specific request of the organisers – please come to me in the break and ask if I’m OK. The system that I set up makes it ok (or not). And when I say I’m ok, ask again! How much support is here? We’ll let you know the cost of putting this on. How much the total is. What are the largest and smallest amounts – so we can celebrate the diversity in the room. And the difference between the largest and smallest amount. There will then be a further opportunity to contribute. Q: What if you’re not ok? A: My fundamental commitment is to myself. These 2 systems ensure I’m taking care of myself. Support of others wakes me up to be present to myself. If there’s one thing I want you to take from the day it’s to SET UP COMMUNITY SUPPORT SYSTEMS. Rosa Parkes sat in the white person’s seat on a bus –but you don’t hear about years of the training, the groups she was part of which enabled her to do that. Gandhi didn’t just wake up one day and think “Salt!” He lived in community for 10 years, spent 7 months meditating on the question of how to oppose British rule. Martin Luther King had a woman in every city. He had slept with 3 of them the night of his big speech. These are not necessarily healthy support systems, but they show the level of support that’s needed for actions like these to happen. More of Dominic’s support systems – his phone, people in different time zones who he can call at any time when he’s working and talk to. So that if he’s not ok he can reach out. These people are not those who are close to me – family, friends or close work colleagues. Those are the people I’m most likely to be triggered by! My support is people who are further away from me. That’s what a community can provide. I met a woman who knew more about support than me – she used to ring me up and ask me uncomfortable questions. There were times it went wrong – I didn’t like the language she used “you need self care”. I thought it made it all about me. Then I realised – it’s not self care because I’m the end product, but because those I’m with aren’t going to have a good experience unless I’m in good shape. It took me a while but I started to learn what she was doing- and then to organise it for myself. I moved to Rio following my heart. There were two realities there – one is the beautiful vibrant place. Everything you hear about it is true – the amazing beaches, fabulous music, energy and vitality. It’s a huge urban forest. What’s less known is that it’s a war zone. 65,000 people die every year mostly in gang violence. It’s a more dangerous place to live than Beirut. Mostly it’s black young men who are dying, from being shot. The weapons aren’t knives or pistols, they’re sub-machine guns, weapons of war. Red Cross personnel are sent there to train because the wounds you see are the wounds you see in a war zone. Part of the situation is that the rich people – unusually – stayed on the low ground and left the high ground to the poor. Which gives the poor a military advantage – which they use. I came back to the UK and then went back to Rio with an intention to do something. I realised there are no neutral acts. One thing I remember was watching a couple in an Amsterdam street having an argument. I heard their voices getting louder and louder, even though they were still standing close together. I wondered if they were getting louder because their bodies were experiencing something as if they were far away – that they weren’t being heard. I remembered something I’d heard about tears – that we evolved them for the time when we came out of the ocean or down from the trees, as a way of getting sand from the beach or dirt from the savannah out of our eyes. That being emotionally hurt by another is to the body like having grit in your eye – so your eye waters. So maybe the body is confused and I shout to compensate for the lack of understanding. When they still don’t hear – I violate their space, by touching them. Justice systems need to understand violence and what’s happening without judgement. That violence is not a bad thing, it’s just a thing. I saw that holding a gun to someone really focuses their attention on you. They find that they are carrying money, and they can give it to you. Suddenly they are listening, and they don’t walk past you. Maybe what’s happening socially is also like turning up the volume. I had a theory – that I needed to get closer instead of staying away, that if I got closer the degree of danger should reduce. But it made me feel frightened! What are the pre-conditions for dialogue to take place? RC is an ongoing research project. It becomes PAINFUL conflict when it meets resistance, when someone preserves the status quo. Or, more truthfully, when someone feels they have to preserve the status quo, because they believe something essential is threatened by the change. Give feedback about the deeper meaning. If you don’t understand the purpose of a feeling you may think the feeling is the problem. There is pain (someone’s pushing a change I’m resisting; someone’s resisting a change I need). What are we doing together to create this? What’s needed to make the conditions for a resolution? You can turn on the TV and find countless programmes – factual and fictional – dedicated to this form of dealing with conflict. It’s in schools and workplaces. It’s in families. We live and breathe this form of dealing with conflict. Question about people with mental illness or conditions that make them antisocial or violent? This is also true about mental illness – we use labels as a way to say “I don’t understand” and move away.. But we need to listen. If the situation gets better after listening, they needed listening to. If not you’ll know more about what’s going on and how to handle it. I went to the nearest shanty town (shows a video of this place, very steep with walkways – can’t even get a motorbike up the paths, and young men maybe 15 to 19 carrying automatic guns. The only people I could find to talk to were kids. Some assumed I was there for drugs – the only reason a gringo would come to this place. Adults were going to work. Teenagers were at school, home or in gangs. The kids were around 7 or 8. This is the age they start to run errands for the gangs. By 9 they will have some level of responsibility. From 9 – 18 you don’t leave a gang – as you are older you start to have a family and may move away. If you’ve lived that long, as the death rate is very high especially among young black men. I come from an acting family and I took a prop with me, a beach ball, which I blew up.. The kids were interested in the map of the world, which part of theUSAwasEngland? During about 30seconds of this conversation I noticed I was less scared. I went back. Sometimes we shared celebrations – about football. I knew about how to celebrate, and the same feeling happened. When they told me bad news I saw they were inviting me in but I didn’t know how to respond. I saw I needed to learn to just sit with horrible stories. I realised I knew community forms for celebration – the party is organised, people come, we join in. But there wasn’t a community form for something horrible. How to organise the community response? Now you can google “Restorative practice” – it was around before. Some people say Restorative systems come from indigenous cultures. I think they come from the groups who are most marginalised. Because these are the people who have the most invested in changing the existing systems of power. Of course it may also be that they kept community ways alive. Gender also plays a part – it’s not a coincidence that most of the people here are women. It’s mostly women who get restorative systems fastest, because they are more marginalised. Restorative systems challenge the centre of power. It’s not a coincidence that the people I talked to were kids. I would call this conversation with the kids a Pre Circle. When we say “Someone is… “ we objectify them. We use the verb “to be” and make them something fixed. In Portuguese it’s a bit easier because there’s a to be which is about what’s current and passing, and another verb to be about what is fixed. If we agree that humans don’t change then we should apply force to make them behave how we want them to, marginalise them, or lock them up. But if we think humans can change we should do something different. Our Justice system is based on “penance”, which is related to a word for fire, for burning. Penance is about burning away the sin, through repentance. The word Punishment comes from the same root. The idea is that the fire causes pain that brings the person back from apathy – from not feeling, from a lack of sensitivity, from being able to feel the pain of the other, to experience what’s happening in the relationship). If it’s true people can’t change I agree that we need to stimulate pain to restart the process of “repentance”, of waking up to the pain that you’ve caused in another. But what if their behaviour is just telling a story, with characters that have roles? What if “She hates me” really means “I’m upset and I don’t know if she cares about me”? We need to apply intelligence – which comes from the words “inter” and “leggere”. Leggere were the bits of wood used to separate the lines of words, to keep them straight. So inter-leggere is about reading between the lines, seeing the deeper truth that isn’t in the obvious words. There are two choices.. we adapt the existing system, keep some of it.. or we replace it. I want to be clear that RC is not about adapting the current system. It’s not about hearing everyone and then saying “and now we’re all going to figure out together how to punish the person who did the thing”. In the 20 years since I met those kids on the street corner, now there’s just been a ruling in Brazilthat every youth court has to include this system (it won’t happen in practice yet because there aren’t resources or people). There are places where families and schoos have replaced the whole system. Restorative systems include addressing ways we experience pain that the justice system doesn’t address. Usually a lot of pain has happened by the time the justice system gets involved, or acts of violence are committed. In RC in Brazil we say that every circle is 500 years old and involves 200 million people. What shows up is the pain of a whole nation. Find one place where someone is generously offering you conflict (they are raising the volume, which can also be by shutting down or turning away). Today we will play with the idea that we know this is a signal that more contact is needed. Many things will have been said or done. Each is a door to the garden – and the garden is the conflict. It doesn’t matter which door. But it is helpful to agree on one act, which both people experienced, so there is a doorway to go through. There is the content – what happened – and the meaning. Both will be needed. All the stories, judgements, thoughts, projections and fantasies about what they’re saying will come up – but don’t get stuck with them. One way to understand this role – to be able to say “I’ll never be the same again after hearing you”. It’s important to know that what enables me (or you) to be impacted without needing training or techniques is SUPPORT. I know that I can stop at any time if it become impossible for me to stay present. I’ve given up on “skills” and “learning” to listen. I think of it as an artisanal form of learning – by doing. Listen to the feedback. Be present. Find out what works by doing. Who else needs to be in the Circle? I have the understanding that there are always 3 parties in the conflict. The conflict happens in some kind of system that’s out of date. Everyone who’s part of that system is in the conflict community, co-responsible for creating the conditions in which the conflict could arise. The person often chooses a doorway that’s smaller than the big thing – a mid level thing. Pre-circles may take a long time. There could be many people – one had 250. DB learnt from Findhorn that 90% of sustainability projects end within a year without succeeding. The reason is they don’t understand conflict. They think having a justice system is optional. In fact there’s always a justice system – that you walk away from conflict, or walk towards it. The strikers had completely given up on the existing system, and needed a way to deal with their disagreements as they were risking being beaten up by police every day. Intentional communities have used RC. In one they backdated the system – a founder who left after a horrible split was invited back to be part of an RC. In a school they decided to strengthen their system using RC and declared a week of RCs to happen in March where anyone could bring anything about racism that had happened at any time – including for people who had left the school. There were many facilitators and circles happening at the same time. How to make this practice available to anyone who needs it? I decided that from the day I left my paid job that I would never charge for the work. It’s never been charged for, never been workshopped. This work doesn’t belong to me. DB tells us how much it cost to put on the workshop, and gives us till the break to put whatever we want in anonymous envelopes. Set up a RC, where one is host. The closer your meaning is to how you are in relation to the act and its consequences the more it helps. These questions are agreed before – the host is doing an agreed job. Sometimes the author has to be heard first, but the host will track that the other needs to be heard. These questions are designed to interrupt the habit to assume we’ve heard when we haven’t. And then the host asks other members of the conflict community. Sometimes it has to happen in a different order – there is too much charge in another person that has to be heard. The intention is to hear everyone. Many people including the Author may feel they are the Receiver of some injustice, and will need to be heard. I saw that part of the role of the facilitator is to listen out for the “victim / perpetrator” frame and challenge it (Sometimes by not intervening). That we are all authors and receivers, and that the whole community has responsibility for the whole system. I also saw that people with experience of facilitation can want to intervene more, to get something to happen, rather than letting the system self correct and thus learn for itself, through simple feedback. Learning to communicate effectively is immensely empowering and transformational. Website on Restorative Circles: http://www.restorativecircles.org/ – links to articles and videos..